1 John 3:18 (NLT) states “Dear children, let’s not merely say that we love each other; let us show the truth by our actions.” John’s saying that the best way to communicate love is through the unity of TRUTH and ACTION. Verbal exchanges are fundamental to our everyday life, but how many of those words are intentionally given? To a child with affirming words as their love language, these verbal exchanges are critical to their understanding of biblical love. Biblical words of affirmation come from a place of genuine praise. Be thoughtful with your words instead of saying, “cute outfit” maybe phrase it by saying “Mia, I love the top you chose today! It really shows your spunky style!” Romans 12:9 (ESV) states, “Let love be genuine…” and let your words be genuine as well. Loving with words is intentionally given, genuine, and custom made. 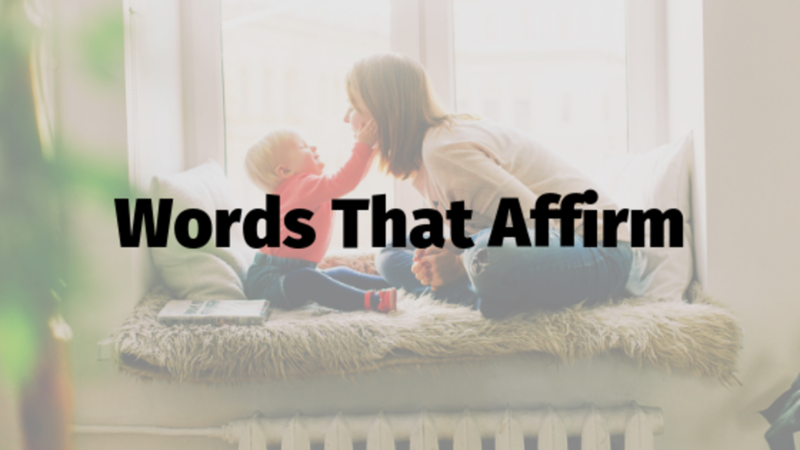 What is something you can do everyday to affirm your child with words?